Whether you travel to Europe, Canada, the United States or elsewhere in this world, we can most likely all agree on the fact that accommodation makes a huge difference when it comes to the convenience of a vacation or business trip. From Canadian Montreal to Dutch Amsterdam, there is a range of amazing hotels out there that add to an unforgettable stay. Where should you begin if you’re not familiar with a destination? Read on for a few great ideas. Amsterdam is a popular destination for travelers, and you can’t go wrong with a Marriott. The Amsterdam Marriott Hotel has top ratings, is located in the heart of the city, and exudes a modern, fresh atmosphere. The Vondelpark and the Van Gogh Museum, for instance, are close by. Stick to your workout routine at the 24-hour fitness center, rent a bike to explore Amsterdam the Dutch way, and treat your taste buds to dinner at the on-site Midtown Grill. The rooms are newly refurbished, featuring a contemporary interior, and some of them have stunning views on the city, so consider asking for a view when you book your room. Harbor, mountain, and city views — you get it all at the Pan Pacific Vancouver. This superior hotel has you choose from a pillow menu for the best night’s sleep. You’re treated to an updated, modern room with numerous luxurious touches. Located right at the waterfront, this hotel doesn’t only come with panoramic views, but also with four restaurants, 24-hour room service, an outdoor pool, as well as a hot tub on the roof of the hotel, and a full-service spa that allows guests to fully unwind. Parking is available. You have buzzing Vancouver with dining and wining facilities on your doorstep. When staying at the Montreal Marriott Chateau Champlain, expect nothing less than being spoiled. At this hotel, modern elements meet historic charm. Take advantage of the gym and pool as well as the French-themed restaurant. Treat yourself at the hair salon or spa. Outward bowing windows in your room have you get a whole different perspective on the city as you sip on a drink from the mini-bar. 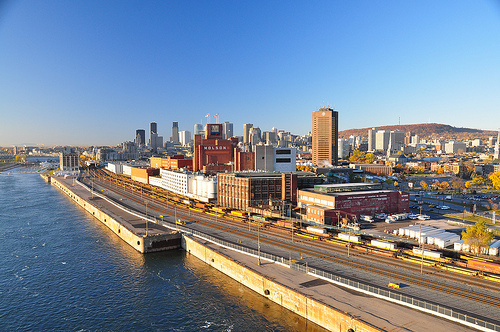 You have historic Montreal right on your doorstep, including a some quaint alleyways and cafés. Explore the many old churches and museums around, or immerse yourself in the vibrant nightlife. Barcelona is one of the favorite European destinations. If your bank account allows, add the cherry on top by checking into Hotel Majestic. This upscale place allows great views on the city, features rain showers in the bathrooms, slippers, coffee machines, as well as large screen LCD TV, luxury bedding and furniture. Wellness programs are offered to forget the stress. Foodies will enjoy themselves, as they can choose between traditional Catalonian and various international cuisines. The hotel is located right on the Passeig de Gràciawith many shops and restaurant. Many sights, including the Gaudi monuments, are within walking distance. This piece was written in ccollaboration with Hipmunk, to bring you selected hotels from around the world.